There has been tension between the kitties for some time now. I got Jello three months ago, plenty of time—I think—for Twister and Wednesday to get used to her, but they still haven’t completely taken her into the fold. The two sleep on my bed together (although they don’t cuddle), they eat side-by-side, and they often groom each other. They can share the same space with Jello, but they get prickly and hissy when she gets too close and vice versa. She’s not exactly a darling to them either. She can be a bully and start some of the fights, so I can’t blame them for not being totally cool with her. I’ve been watching old episodes of Animal Planet’s “My Cat from Hell” (Season 1 & 2) to get an idea on how to make my purr babies get along. I’ve picked up a few tips from Jackson Galaxy, a cat behaviorist and the host of the show, and have decided to catify my apartment more and make the place more enjoyable for the kitties. Maybe when they have a lot of things to play with Twister won’t see Jello as prey and Jello won’t see Wednesday as her punching bag (although Wednesday has started fighting back!). I’ve also increased their playtime. I normally do one-on-one sessions, but now I try to get the trio involved. They need to learn how to relax with each other! 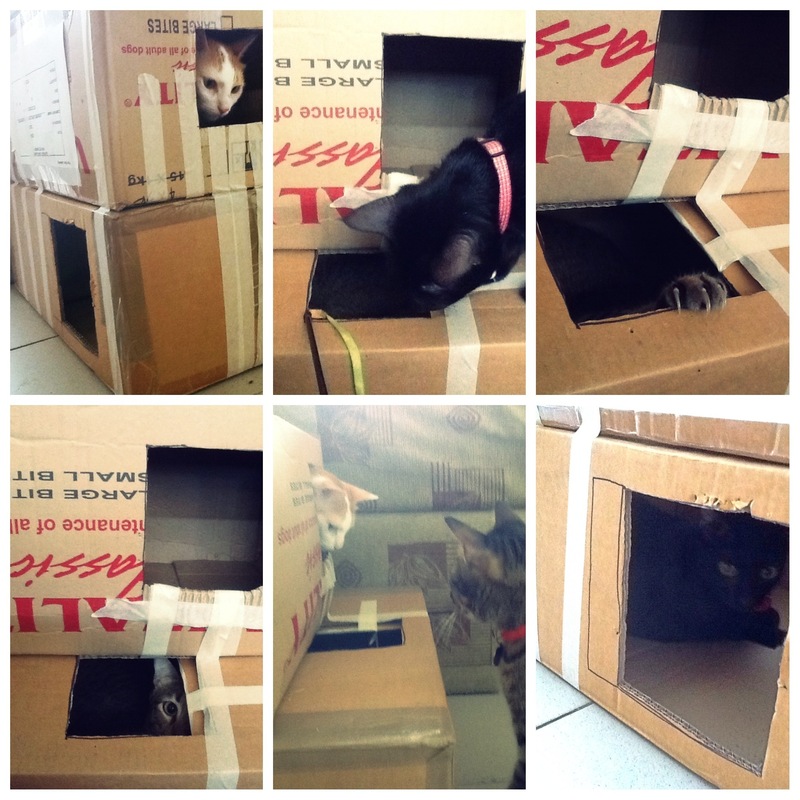 This morning I put together a make-shift cat playhouse for them. I taped two cardboard boxes together and cut some holes in it. It’s not the prettiest thing in the world, but the three loved it! They sat with me while I constructed it and the whole time they were keeping a close, suspicious eye on each other, of course! And then when it was done, they took turns going in and out of the structure. The cardboard boxes have saved the day! 🙂 I think I’m going to get more and make more fun houses for them! I’m enjoying the whole creating thing as well. Yay! Maybe if I’M more relaxed and not worried about the things that go on around me or my personal situation, my cats would absorb my good vibes and be less jumpy and we could all be one big happy family. 🙂 We’ll see!